The latest free game from the Humble Bundle store has been revealed, and it’s none other than Tacoma – the first-person space station-set mystery adventure, and developer Fullbright’s follow-up to the award-winning Gone Home. 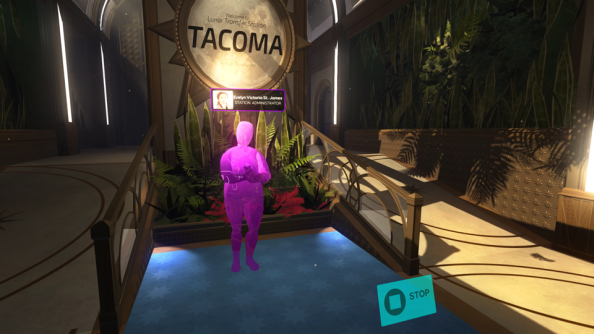 Tacoma was released on PC in August 2017 – four years after the release of Gone Home – although only appeared on PS4 in May last year. It’s been on offer many times since, but this is the first time any store has given the game away for nothing. It’s currently priced as £14.99/$19.99 on Steam and has a rating of ‘Very Positive’, so that’s a good deal. Humble don’t offer many games for free, as they’re generally the site for excellent bundle-based deals instead – although now and again some great freebies sneak through. The LEGO Lord of the Rings games were actually given away for free mere days before that and LEGO The Hobbit were de-listed from all digital game stores. We’re presuming that won’t happen with Tacoma, but you can never be too sure – so better pick it up now. You can get Tacoma for free by heading over to the game’s page on the Humble store and clicking ‘Get the Game’ – but you better be fast, because the deal’s only around until tomorrow. There is a small catch, however. While you don’t have to activate the game or use it before a certain time (like some previous Humble giveaways), it’s not a Steam key – you have to download it direct from Humble themselves. The good news is, it appears DRM free. There’s been a spate of highly-generous game-giving recently. Epic Games Store continues to give away neat titles to persuade players to use the launcher, with Jonathan Blow’s The Witness up next. XCOM 2 is also free this weekend, although only to try – not to keep, although the game and all its DLC is heavily discounted too. If you’re planning on picking up Tacoma though, best make it fast. You’ve only got until tomorrow.